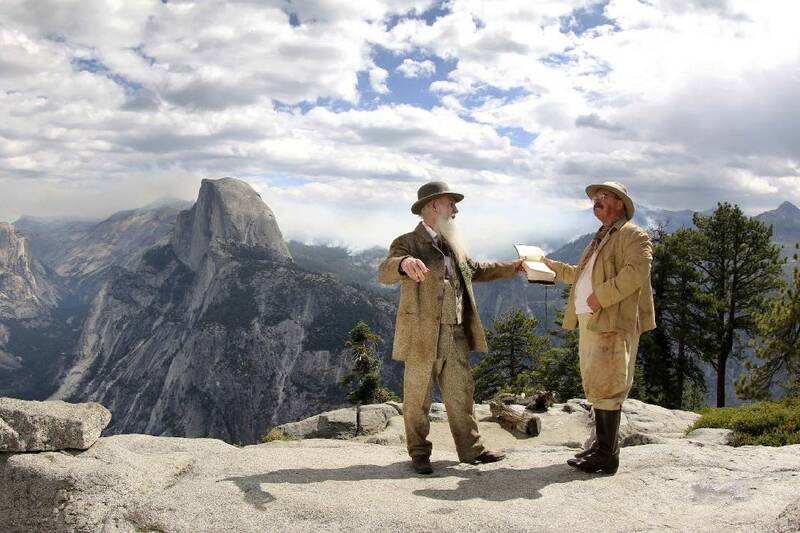 Lee Stetson, left, as naturalist and poet John Muir and Joe Wiegand as President Teddy Roosevelt appear in a scene from "National Parks Adventure 3D." Now showing at the Imax Theater, the film re-creates the camping trip in Yosemite Valley that led to the creation of the national park system 100 years ago. Wiegand will visit today for a screening that includes a program with him in character. › What: Joe Wiegand’s Teddy Roosevelt Show. › When: 6-7:30 p.m. today, April 14. › Where: Imax Theater, 201 Chestnut St.
› Admission: $8 Tennessee Aquarium members, $11.95 nonmembers. Joe Wiegand talks about his career portrayals of Teddy Roosevelt and his connections to Chattanooga in an interview. Joe Wiegand, whose cross-country portrayals of Teddy Roosevelt landed him a film role, will be in Chattanooga today, April 14, for an appearance at the Imax Theater, which is showing the movie he stars in. Wiegand will introduce a special screening of "National Parks Adventure 3D," then deliver a rousing reprisal of Roosevelt afterward. Wiegand plays the 26th president in the film, which offers an overview of the 100-year history of national parks and Roosevelt's role in protecting what would become 230 million acres of public lands. Audiences will relive the famous three-day camping trip Roosevelt spent in Yosemite with naturalist and poet John Muir. That 1903 expedition helped change the course of history, fueling Roosevelt's determination to protect the "temples of nature" for future generations. As part of his Teddy Roosevelt Show, guests can pose for photos with Wiegand in character, be entertained by Roosevelt's classic wisdom, learn presidential history and discover the roots of the park system. Wiegand began his portrayal of Roosevelt in 2004 at the pinnacle of a 25-year career in public policy and political campaigns. He began his travels across America with the show in 2008, a year that marked Roosevelt's 150th birthday and the 100th anniversary of the final full year of his presidency. Wiegand has delivered performances at the White House, in all 50 states and on the History Channel. He was recommended to the filmmakers by his friend Lee Stetson, who plays Muir in the film. "Clambering atop Glacier Point and camping among the great sequoias of Mariposa Grove was a transformational experience for me as an actor and an historian," he says of the filming. Wiegand's Teddy Roosevelt Show has been praised for its authenticity and energy. In it, he relates stories of Roosevelt's childhood in New York City, "an asthmatic boy with a passion for nature and all its creatures and critters," says Wiegand. "I'll relate a youth spent in outdoor adventure and natural science and a young adulthood overcoming great personal tragedy. I'll tell stories from the Northwoods of Maine to the Badlands of the Dakota Territory. I'll answer any questions and be happy to pose for photos. Finally, the children will surely enjoy the stories about Mrs. Roosevelt and me rearing six children at the White House. Mrs. Roosevelt said she reared seven children there, and that I was her worstest and most terrible child." Wiegand is a 1987 political science graduate of the University of the South in Sewanee, Tenn. His Chattanooga visit comes just before National Park Week, April 16-24.